Theban is a writing system now mainly used by Wicca and other witchcraft as a way to hide magical writings like the contents of a Book of Shadows. The alphabet is said to be existing since the middle ages but there is no information about the origin of the alphabet. It is said that by using this alphabet, people can obtain more magic power by being forced to concentrating on writing in Theban. 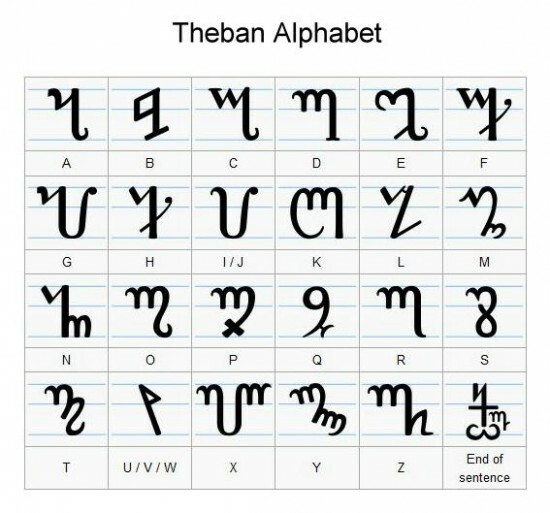 Generally, Theban alphabet corresponds with Latin alphabet except that there are no capital and lowercase difference. There is only one period symbol available for punctuations, which indicates the end of sentence. You can use the Theban font below to generate your ciphered text. Below is a collection of theban font. The following tool will convert your desired text into images using theban font. Simply enter your text, and then select your desired color and size and hit "GENERATE" button. You can save your image by right-clicking on the image, or get codes to embed your images on the web by clicking on the "EMBED" button.